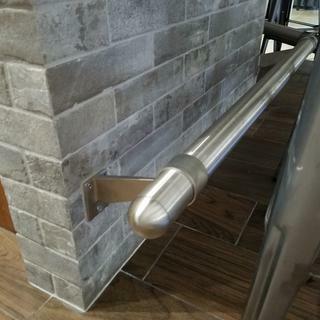 If you have access to the back of your bar molding, you can add the unique support and minimalist look of contemporary-style bar mounted foot rail brackets. If you have access to each side of your bar molding, these contemporary-style bar mount brackets are a great option for a unique look and an added level of convenience. This stainless steel bracket, along with 2" metal tubing and other matching components, is a standout addition to any home or commercial bar. 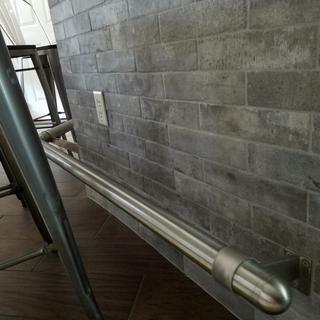 This stylish form of bar foot rail bracket creates a modern look where the metal tubing looks almost as it is floating next to the bar. It also allows you to maintain a clean floor, eliminate worry of guests stubbing their toes on floor brackets, and avoid the dilemma of drilling into the floor during installation. The durable brushed steel finish of this bar bracket will precisely match your Brushed Stainless Steel two-inch outside diameter bar rail tubing. Contemporary bar brackets include a back access bolt to allow for weight bearing on the bar rail. To install the bar rail bracket, you will need to use a screwdriver to attach the 2 mounting screws on the front end of the bar facing, and the nut and bolt assembly on the back end of the bar. The set screw goes into the hole where the bracket holds the tube and is screwed into the bar rail tubing. This modern bracket style allow you to choose the height of your bar rail. Be sure to carefully measure where each bracket will be placed before drilling into your bar. For proper support, bar brackets should be placed at each end of the tubing, plus one for every 4-foot increment. Check out our Complete Guide to Bar Rails for ordering hints, do-it-yourself installation instructions and more! Well made commercial quality product. This bar rail was perfect! It turned out to be a little more complicated to install but that was only because of the brick tile. Once the holes were drilled the rest went together easy. Now no more scuffs from shoes hitting the wall! Yeah!! Like the contemporary look so i ordered one to see if I like it. If I like it I'll order the rest of what I need. Hi, I'm wondering if this is a casted piece or a solid stainless which can be modified? BEST ANSWER: This bracket is a made from a cast.